Bus route 14: Wilton-Kilbirnie via Roseneath (Mon-Sun). Buses stop right outside the library. For more public transport information, contact Metlink on 0800 801-700. 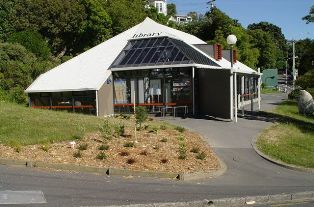 There is a block of 1 hour parking on Moorhouse Street, next to the library entrance. Parking along the rest of Moorhouse Street has no time limit and no charge. The entrance is located on the corner of Lennel Road and Moorhouse Street.